Father James McCormick, pastor of St. James Parish in Erie, has buried at least 10 people who’ve succumbed to opioid addiction. The statistic—while disturbing—is not surprising when considered alongside national figures showing that an estimated 64,000 people per year die from drug overdoses in the United States. Yet this eastside parish of 1,000 families has found itself in the crosshairs of the national opioid epidemic. Nearly all of the 10 funerals at St. James have involved inactive parishioners or someone who has a connection to families of parishioners. Each death is a moment in which a pastor is called to be a compassionate shepherd. Dr. Steven Large, director, Health & Counseling Services, Gannon University. As a pastor, Father McCormick knows he must help families comprehend the misunderstood nature of the epidemic: addiction. Narcotics, particularly heroin, are highly addictive and can be mentally and physical difficult to confront and overcome. As a member of the newly created Opioid Task Force of the Diocese of Erie, Father McCormick was happy to be part of a recent effort to inform clergy about the growing epidemic. 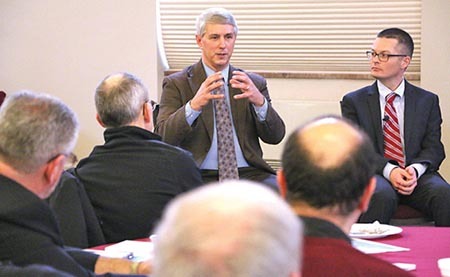 On Feb. 22, the task force presented a panel discussion and resources to dozens of clergy who gathered in the Yehl Ballrooom at Gannon University in downtown Erie. Under the direction of Ann Badach, executive director of Catholic Charities of the Diocese of Erie, the task force offered practical and community-specific information regarding the reality of the opioid crisis. Introduced by Bishop Lawrence Persico, task force members offered their expertise in various areas, including drug and alcohol counseling, worship and education. There was a panel discussion, too, which included the perspective of diocesan priests Father John Jacquel, pastor of St. John the Baptist and Holy Rosary parishes, both in Erie, and Father Ross Miceli, pastor of St. Boniface Parish, Kersey, and campus minister for the Elk County Catholic School System. Each priest in attendance at the February meeting was encouraged to share specially prepared prayer resources and other information with parishioners affected by the opioid epidemic. Another idea is for parishes to consider establishing parish action teams to explore ways to respond to the opioid crisis. Father McCormick said he already has shared some of those newly developed resources with two families whose child and grandchild are addicted. He also will continue to offer a Mass held at St. James every Sept. 14 for those suffering from addiction and their families.